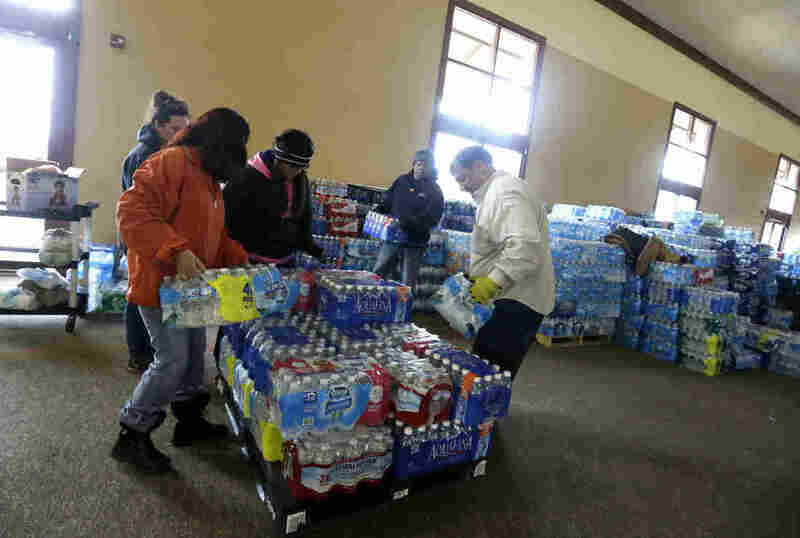 Water Crisis Continues In Flint After Judge Orders Water Delivery The state of Michigan is fighting a judge's order mandating water delivery to Flint residents who need it. Democrat state Sen. Jim Ananich of Flint discusses the controversy. The state of Michigan is fighting a judge's order mandating water delivery to Flint residents who need it. Democrat state Sen. Jim Ananich of Flint discusses the controversy. In Flint, Mich., many residents are still struggling to get enough safe drinking water. It's been over a year and a half since the first city tests showed dangerous lead levels in a Flint resident's water. And last week, a federal judge demanded the state deliver safe bottled drinking water to all Flint residents who don't have functioning water filters. But the state of Michigan is challenging that order saying it would cost some $10 million a month to deliver the amount of water the court is asking for. And Michigan says it's not necessary because it already delivers bottled water to anyone who asks for it. We asked to speak with Michigan Governor Rick Snyder, but a spokeswoman said the governor is traveling in China and is unavailable for comment. For another perspective on this crisis, we're joined by state Democratic Senator Jim Ananich, who represents the 27th District in Michigan - that includes the city of Flint. Senator Ananich, welcome to the program. JIM ANANICH: Thanks for having me. WERTHEIMER: First of all, why did the judge issue this injunction in the first place? There are already water distribution centers in the city. ANANICH: I think he sees, like most of us that live in Flint, that there's a lot of rhetoric and a lot of promises - many of them false promises - coming out of Lansing, out of the administration, claiming all this great effort on behalf of Flint. And I think anybody who comes here or who takes a minute to look sees that there's a lot of holes still and that a lot of families just aren't getting the help they need for a problem they didn't create. So I think it was a ruling that was meant to protect the public. And I think the governor and other folks should be working to try to make sure that happens as opposed to trying to use legal maneuvering to make sure the residents of Flint don't get the help they need. WERTHEIMER: Michigan pushed back on the order. The state says it already sends people water if they need it and that this will just get in their way, hamper their ability to carry out the program they've got in place. You say, no. ANANICH: Well, no, I think the problem is they held up this great program that they think they have and the residents of Flint just don't feel it. And, you know, one of the things in the order it says to all homes that don't have a properly installed working filter. So clearly, they've been saying, oh, don't worry about it. All these homes have properly working filters. Well, if they do have properly working filters like they say they do, and they're regularly checking like they say that they are, this shouldn't be a problem at all. WERTHEIMER: What about the cost? We're embarking on a period, I think, where it's fairly safe to say that budgets will be cut, things will be done. ANANICH: Well, I mean, I think when you acknowledge that you failed the citizens, which the governor and his team have acknowledged this was a state failure on the behalf of the Department of Environmental Quality, the Department of Health and Human Services and the state-appointed emergency manager, they have a responsibility to get this right. And if they were doing the things they said they were doing, then this order shouldn't be a problem at all. It's only for folks that don't have a working filter. And they promise, they say at every chance they get, 95 percent of people we talked to have a working filter and all these services are happening. So it shouldn't be a problem at all. And I think, as a resident of Flint, and my neighbors, I can tell you we don't feel the urgency that I think that this crisis deserves. WERTHEIMER: As I'm sure you remember, President-elect Trump promised to fix this. He didn't say how or to what extent. Do you see this issue being settled any time soon by anybody? ANANICH: Well, I mean, you know, we'll - obviously, we'll take help from anybody that'll give it to us. We're also going to hold people accountable for statements they make, so details matter in this kind of business. And, you know, I think he's going to have to explain how he plans on doing that. I can tell you, as of right now, there's been a handful, maybe 300 lines have been replaced, and the citizens of Flint deserve to have their lines replaced. They need to have the health, nutrition and educational services to help with the children that were hurt and seniors and other folks that have been damaged. So I think this is a long ways from being resolved. Obviously, there's been some areas where there's been steps in the right direction. But I think, as opposed to patting themselves on the back, they need to really get down and make sure that the families of Flint get the help they need. WERTHEIMER: Senator Jim Ananich represents the 27th District in Michigan, which is where the city of Flint is located. Senator, thank you so much for talking to us. ANANICH: Thank you very much for having me. Volunteers load a pallet with bottled water to be distributed outside Our Lady of Guadalupe Church in Flint, Mich., in February. A federal judge has ordered state and local governments to provide home delivery of bottled water to the residents of Flint, Mich., as they continue to navigate a years-long crisis over lead-laced water. U.S. District Judge David Lawson said in his order that the city and state must provide at least four cases of water per resident every week, unless the officials verify the household has a water filter installed that is properly maintained or the residents opt out. Flint is in the process of repairing its water system after the city switched to a new water source in 2014 without implementing proper corrosion controls. The untreated water corroded the pipes, causing lead to leach out of the pipes. For months, officials have been handing out water filters and distributing bottled water at points throughout the city. But on Thursday, the judge said that's not enough. The water filters do bring the lead levels below the EPA's action levels, he said, but the distribution and monitoring efforts have been "uneven at best." There's no guarantee the filters are "properly installed and maintained," Lawson wrote. And he said that picking up water at distribution points "has become a major challenge" for some residents in Flint, where 40 percent of people live below the poverty line. He cites testimony from residents who spoke of confusion about where to pick up the water and how much they were allowed to take, long lines and the cost of transportation needed to take home the heavy bottles. Some people said they were not given enough to meet their family's needs, and some distribution points were said to have short, inconvenient hours. "The fact that such items are available does not mean that they are reliably accessible or effective in furnishing safe drinking water to every household," Lawson wrote. "Indeed, the endeavor of hunting for water has become a dominant activity in some Flint residents' daily lives." The judge's order granted a motion for a preliminary injunction seeking immediate, reliable access to safe water, as part of a larger case over lead levels in Flint's water that was filed by the American Civil Liberties Union, the Natural Resources Defense Council and several others. "Activists have fought hard for home delivery for more than a year," as Michigan Radio reports. "Recent tests showed improvement [in lead levels], but lead levels continue to be higher than acceptable in many Flint homes." As The Two-Way has reported, many people and groups have come under fire for their handling of the crisis in Flint. An independent task force concluded earlier this year that primary responsibility lies with a state environmental agency called the Michigan Department of Environmental Quality, but many others failed to take proper action as the lead levels rose. "In modern society, when we turn on a faucet, we expect safe drinking water to flow out. As the evidence shows, this is no longer the case in Flint," Lawson wrote in his order. "The Flint water crisis has in effect turned back the clock to a time when people traveled to central water sources to fill their buckets and carry the water home." A spokesperson for Michigan Gov. Rick Snyder tells Michigan Radio that "the government's attorneys are reviewing the order."